This is perhaps the Classic among the classics. Its ingeniously proportioned, distinctive form has made this height-adjustable table one of the most popular design icons of the 20th century. It is named after the summer house E 1027 “Maison en bord de mer” that Eileen Gray built for herself and for her collaborator, Jean Badovici. The secret code-name likewise comes from her: E is for Eileen, 10 for Jean (J is the 10th letter of the alphabet), 2 for B(adovici) and 7 for G(ray). Side table. Height-adjustable base, powder-coated tubular steel in black. Tabletop grey smoked glass. Dimensions: W 52 cm, H 102 cm. 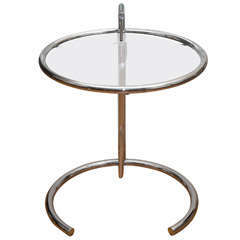 Vintage Eileen Gray occasional table model 1027 in white. Adjustable from 55cm to a maximum of 87cm high. Built in the 1970s. Eileen grey iconic style E1027 adjustable chrome and glass table. The circular top on a ratchet mechanism, above a circular base. Pair of Milo Baughman chrome and glass tables. Has smoked glass tops, octagonal shape and flat chrome frames.